n a board used to stabilize the position of a pediatric patient, or a patient with limited psychomotor control. It comes in various sizes and has soft flaps that surround and hold the patient. n.pl a major deoxyribonucleic acid virus to which the papillomavirus and polyomavirus belong. Viruses in this family have a double-stranded, supercoiled, circular molecular structure with icosahedral symmetry. They tie the little ones down on papoose boards and do unnecessary baby root canals for the bonus money. For this reason he recommends children be restrained in a papoose board and sedated, if necessary. Joey would have to be held down or strapped to a papoose board and might suffer lasting psychological damage. Babies invariably scream when strapped to the papoose board, which I'm sure has the same physiologic effects of tachycardia and tachypnea, and probably a drop in [O. 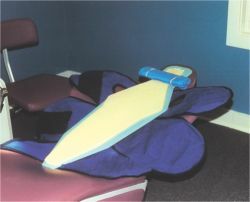 The Papoose Board prevents injury and enables the dentist to safely provide the necessary treatment. Examples are papoose boards or Rainbow wraps--products designed to both hold patients down and offer them security.